When a bike service has been completed, you can mark the appointment as complete and let the customer know that their bike is ready in one easy step! In the appointment menu near the top of the page, click the button labelled “Complete”. 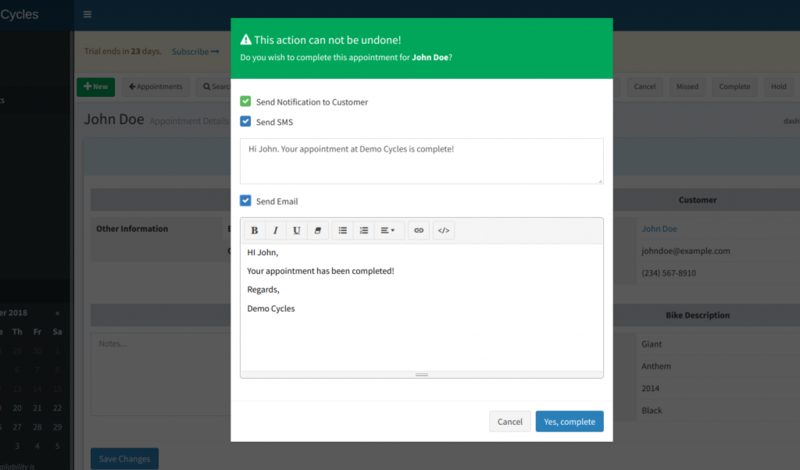 This will activate open a modal dialogue with options for completing the appointment and notifying the customer. Notifications are sent to the customer upon completion by default. If the customer’s phone number has enabled SMS notifications, they will receive an SMS message letting them know their bike is ready. If the phone number not present or SMS is not enabled, the customer will be notified by email. The modal dialogue allows you to choose to send notifications by SMS , email, or both. If you do not wish to send any notification when an appointment is completed, make sure the checkbox labelled “Send Notification to Customer” is left unchecked. Your default SMS and email templates are loaded into the message text areas automatically. You can edit these messages any want you like, and then just click the button “Yes, Complete” to send the notifications and mark the appointment as complete.